They are based in Norway, where WCAG accessibility is not a just good practice, but actually required by law (go, Norway!). As they were developing a feature that allows user-selectable color theming for their main product, they faced a challenge: automatically adjusting the font color based on the selected background color of the container. If the background is dark, then it would be ideal to have a white text to keep it WCAG contrast compliant. But what happens if a light background color is selected instead? The text is both illegible and fails accessibility. They used an elegant approach and solved the issue using the "color" npm package, adding conditional borders and automatic secondary color generation while they were at it. The easiest approach I could think for this implies running HSL colors. Setting the background declarations as HSL where each parameter is a CSS custom property allows for a really simple way to determine lightness and use it as a base for our conditional statements. This should allow us to swap the background to any color we’d like at runtime by changing the variables and running an if/else statement to change the foreground color. Except... we don’t have if/else statements on CSS… or do we? Since the introduction of CSS variables, we also got conditional statements to go with them. Or sort of. This trick is based on the fact that some CSS parameters get capped to a min and max value. For instance, think opacity. The valid range is 0 to 1, so we normally keep it there. But we can also declare an opacity of 2, 3, or 1000, and it will be capped to 1 and interpreted as such. In a similar fashion, we can even declare a negative opacity value, and get it capped to 0. The lightness parameter of an HSL color declaration behaves in a similar way, capping any negative value to 0 (which results in black, whatever the hue and saturation happen to be) and anything above 100% is capped to 100% (which is always white). So, we can declare the color as HSL, subtract the desired threshold from the lightness parameter, then multiply by 100% to force it to overshoot one of the limits (either sub-zero or higher than 100%). Since we need negative results to resolve in white and positive results to resolve in black, we also have to invert it multiplying the result by -1. Let’s review that bit of code: starting from a lightness of 80 and considering a 60 threshold, the subtraction results in 20, which multiplied by -100%, results in -2000% capped to 0%. Our background is lighter than the threshold, so we consider it light and apply black text. If we had set the --light variable as 20, the subtraction would have resulted in -40, which multiplied by -100% would turn 4000%, capped to 100%. Our light variable is lower than the threshold, therefore we consider it a "dark" background and apply white text to keep a high contrast. When the background of an element becomes too light, it can get easily lost against a white background. We might have a button and not even notice it. To provide a better UI on really light colors, we can set a border based on the very same background color, only darker. A light background with a dark border based on that background color. To achieve that, we can use the same technique, but apply it to the alpha channel of an HSLA declaration. That way, we can adjust the color as needed, then have either fully transparent or fully opaque. Assuming a hue of 0 and saturation at 100%, the above code will provide a fully opaque, pure red border at 70% the original lightness if the background lightness is higher than 80, or a fully transparent border (and therefore, no border at all) if it’s darker. filter: hue-rotate(60): This is the first that comes to mind, but it’s not the best solution, as it would affect the color of the child elements. If necessary, it can be reversed with an opposite rotation. HSL hue + 60: The other option is getting our hue variable and adding 60 to it. Since the hue parameter doesn’t have that capping behavior at 360 but instead wraps around (as any CSS <angle> type does), it should work without any issues. Think 400deg=40deg, 480deg=120deg, etc. Considering this, we can add a modifier class for our secondary-colored elements that adds 60 to the hue value. Since self-modifying variables are not available in CSS (i.e. there’s no such thing as --hue: calc(var(--hue) + 60) ), we can add a new auxiliary variable for our hue manipulation to our base style and use it in the background and border declaration. The best thing about this approach is that it’ll automatically adapt all our calculations to the new hue and apply them to the properties, because of CSS custom properties scoping. Except it doesn’t. Some hues get really problematic (particularly yellows and cyans), as they are displayed way brighter than others (e.g. reds and blues) despite having the same lightness value. In consequence, some colors are treated as dark and given white text despite being extremely bright. I’m sure many of you might have noticed it way ahead, but for the rest of us, turns out the lightness we perceive is not the same as the HSL lightness. Luckily, we have some methods to weigh in the hue lightness and adapt our code so it responds to hue as well. To do that, we need to take into consideration the perceived lightness of the three primary colors by giving each a coefficient corresponding to how light or dark the human eye perceives it. This is normally referred to as luma. The first obvious implication of going with a luma-corrected approach is that we cannot use HSL since CSS doesn’t have native methods to access the RGB values of an HSL declaration. So, we need to switch to an RBG declaration for the backgrounds, calculate the luma from whatever method we choose, and use it on our foreground color declaration, which can (and will) still be HSL. /* the threshold at which colors are considered "light". /* the threshold at which a darker border will be applied. For the conditional borders, we need to turn the declaration into RGBA, and once again, use the alpha channel to make it either fully transparent or fully opaque. Pretty much the same thing as before, only running RGBA instead of HSLA. The darker shade is obtained by subtracting 50 from each channel. There's a really weird bug on WebKit on iOS that will show a black border instead of the appropriate color if using variables in the RGBA parameters of the shorthand border declaration. The solution is declaring the border in longhand. Thanks Joel for pointing out the bug! And there we have it, this time for good. IE is excluded due to the use of CSS variables. Edge doesn’t have that capping behavior we used throughout. It sees the declaration, deems it nonsense, and discards it altogether as it would any broken/unknown rule. Every other major browser should work. This is awesome, something I was looking for long time. Thank you Facundo for sharing. 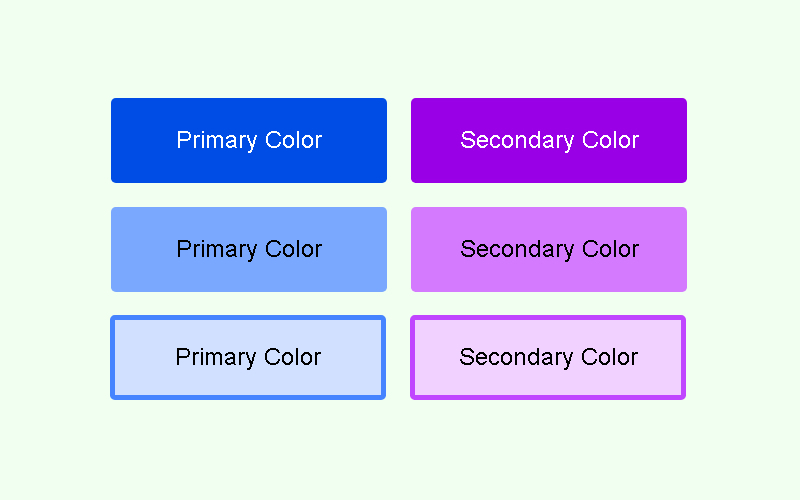 Wow, great post about working with color in css. I’m finding on iOS the border is always black (or transparent black), so WebKit is messing up somewhere. Turned out it was a really weird bug, seems like WebKit won’t accept variables in the RGBA declaration when used in the shorthand version of the border, plus the integers vs decimals I thought first. Anyway, the solution is changing the border declaration to longhand format and creating the darker shade from a subtraction. Thanks for the input! I’ll update the post with the modified declaration. Surely fun to see, hardly can see any case where this is useful. Believe it or not, I agree with you on that one. It’s more of a pushing-the-limits idea than something we would actually use in production. Still, when developing or reading this type of posts, there’s always something to take away. Maybe we can use the capping of the opacity and alpha values for other calcs, maybe the conditional border has some merit to it. This particular implementation is just aimed as a live preview when creating a custom theme for a product, but we might as well set all those weird calcs at the root then color the backgrounds of our elements modifying the –r, –g, and –b values, which should make our whole websites automatically adapt the foreground color to the bg. That might be useful when inserting a component into different environments, or when a state change causes the background to switch. Brilliant, but what about color-blind users? The perceived luminance might still be a gotcha for them. Thanks Chris! That’s a legit concern, specially considering that the most common form of color-blindness is red-green, and those have quite different weights in the perceived lightness calc. I got to admit I don’t really know the answer, despite investing quite some hours trying to research that particular issue when I was writing the article. If you have a good source on how color-blindness relates to perceived lightness, I’ll be eager to take a good look at it. I haven’t been able to find any papers on the topic, unfortunately. However I did check the demo with the Chrome browser “MonoChrome” extension (https://chrome.google.com/webstore/detail/monochrome/nahpfoghefabhigpjfhgliafalpejclf) enabled, and it seems to be OK. In the last codepen demo. Only change of green affects font color, is that a accident? No, that’s just how RGB colors work. The background simply doesn’t get light enough without mixing some green in. It’s a pretty weird and non intuitive color system. Maybe the initial values are giving you that sensation, but set the green to a higher value then change the red or blue, and you’ll see the text react to those changes as well. This is one of the most coolest things I’ve ever read about CSS variables and how to really use them! Very enlightening. Thanks for sharing.